There remains some doubt in the aftermath of the Iraq war as to whether Saddam Hussein's regime was as dangerous as the actions of the invading 'coalition' forces seemed to indicate. In addition to the hyperbole of individual texts and utterances, such as the 'sexing-up' of the famous dossier which gave rise to the notion that there was an imminent danger to the UK and other countries, the case for going to war was built up over a larger set of texts using more subtle and sometimes even unconscious linguistic means. One such is the choice between two words which are superficially almost synonymous: threat and risk. The British National Corpus (BNC), which consists of 100 million words of electronically-searchable British English, demonstrates that there are significant differences between these semantically similar words. There are similar numbers of occurrences of risk* (15801) and threat* (14081) in the corpus, but once we look at the words in their context — by producing concordances — it is plain that they operate differently in context. Risk as a noun is often preceded by adjectives of extent, both large and small, such as small, large, less, increased. The adjectives preceding the noun threat, on the other hand, are rarer and more likely to emphasise the gravity of the danger such as serious, imminent, dangerous. The BNC has no adjectives preceding threat which minimise or downplay the danger. While the potential meaning of risk might therefore seem quite nuanced, as it is collocated with the full range of quantifiers, the very use of the word threat asserts that there is something serious to be concerned about. The second major difference is due to the way the two words work as verbs (threat/en, risk). His detectives risk their lives. Ginger's character was too erratic to risk letting her have complete control. He will risk affecting the morale of his workforce. ...better to accept these plans than risk losing the chance to have the site improved. ...young people may well risk the scorn of their peers to belong to it. Las Vegas water demands may threaten desert ecology. I couldn't see how else this swine of a man could threaten her. ...fear is used to threaten security. With few exceptions, the occurrences of both noun and verb (threat and threaten) in the BNC appear to be constructed as something unpleasant or unwanted being directed towards the interests of those on the side of 'good' by those on the 'other' side. Generally, threat/en is used to assert the existence of likely danger, usually for the producer and the audience or some third party. The audience is expected to fear the danger and/or empathise with the victim(s) and to see the Actor as a perpetrator, rather than a rational decision-maker who weighs up the pros and cons, as would be the case with risk. While threat and risk are superficially direct alternatives for presenting a situation where danger could ensue from an action, their differing syntactic and semantic properties, incline users to choose them according to their perspective on the situation. The use of these words is of interest in the presentation of the conditions pertaining before the UK joined the US in attacking Iraq. The British Prime Minister, Tony Blair's evidence to the Iraq Inquiry on 29th January 2011 demonstrates threat and risk in action both in Blair's language and that of his questioners. Between them, there are 44 occurrences of risk and 53 of threat, which is enough to show any repeating patterns of usage and how these compare with the BNC. Today, we are going to be faced with exactly the same types of decisions and we are going to have to make that judgment on risk, and my judgment -- it may be other people don't take this view, and that's for the leaders of today to decide -- my judgment is you don't take any risks with this issue. The other frequent use of risk is in a phrase which occurs nowhere in the BNC and is therefore either Blair's own coinage or more modern than the BNC's 1990's data. This phrase, which occurs six times, is calculus of risk. Like in the BNC examples, risk is treated here by both Blair and his questioners as something that can be weighed up and measured and can be minimal as well as serious. The second word, threat, is used mainly as a noun in this data. There are only four occurrences of the verb threaten, two of them referring to Russia, who had threatened to veto a proposed Security Council Resolution, and the other two placing Saddam Hussein in the role of Actor and aggressor towards the West (i.e. 'us'): I believe he threatened, not just the region but the world. What changed after September 11 was that, if necessary, and there was no other way of dealing with this threat, we were going to remove him. Where the threat was not presupposed in this way, but occurred, for example, with an indefinite article or with verbs like believe, it is mainly where Blair explains how he saw the situation at the time. The reason was to say: here we have this situation, in which we believe there is a threat, America believes there is a threat, we are going to act jointly. What changed after September 11 was that, if necessary, and there was no other way of dealing with this risk, we were going to remove him. The reason was to say: here we have this situation, in which we believe there is a risk, America believes there is a risk, we are going to act jointly. The result of this intervention in Blair's original utterances is variable. For one thing, the word risk implies both sides of the coin, so that the potential for a military intervention to make things worse as well as better is implicit. But even if the risk were to be taken as referring to the possibility of Hussein posing a danger to the West, the extent and imminence of that danger seem to be muted in comparison to the more serious and imminent nature of a threat. Consequently, an intervention responding to a risk seems to be more calculated and controlled, but might therefore also be more likely to be subjected to criticism or perceived as wrong or unjustified, that the 'inevitably necessary' response to a threat. It is unlikely that Blair or his questioners used threat or risk deliberately or self-consciously to manipulate the Inquiry or the public. Most of their usage echoes the wider usage found in the BNC. 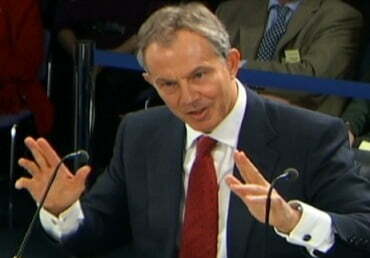 However, Blair could have used threat and risk differently to more exactly match the situation before the invasion as it is now understood, and mitigate the normal differences between threat (an imminent and serious danger from an aggressor to 'us') and risk (the measurable and variable danger that may flow from our action or inaction). He could have explained that it appeared that Hussein might be trying to develop weapons systems which could pose a risk to the stability of the world. He could have said that there was some perception of the West feeling threatened by Iraq. But of course from the government's perspective it was favorable for Hussein to be perceived as a threat and not a risk, because the former, and not the latter, requires an immediate and decisive response.